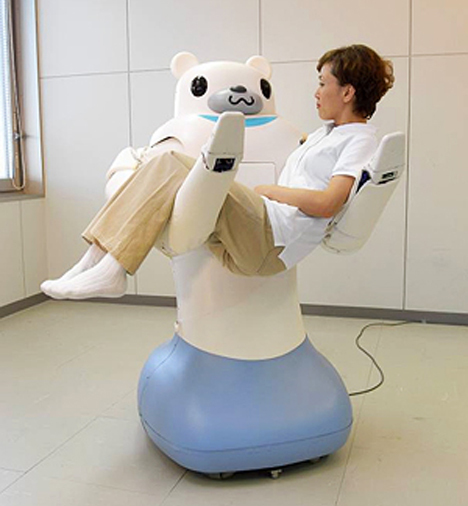 Meet RIBA, a robot nurse that resembles a friendly bear. RIBA -- short for "Robot for Interactive Body Assistance" -- was developed by researchers at Japan's Institute of Physical and Chemical Research (RIKEN) and Tokai Rubber Industries, Ltd. (TRI). Designed primarily to assist nurses by lifting patients in and out of their beds and wheelchairs (as well as on and off the toilet), the 180-kilogram (400-lb) robot can safely pick up and carry people weighing as much as 61 kilograms (135 lbs). The cheery-looking machine has long, multi-jointed arms embedded with an array of tactile sensors that help it optimize the lifting and carrying of humans. For safety purposes, RIBA's entire body is covered in a soft skin molded from an advanced lightweight urethane foam developed by TRI. The soft skin is designed to ensure the comfort of patients while they are being carried. In addition, the arm joints yield slightly under pressure -- much like human arms do -- further increasing the level of comfort and safety. 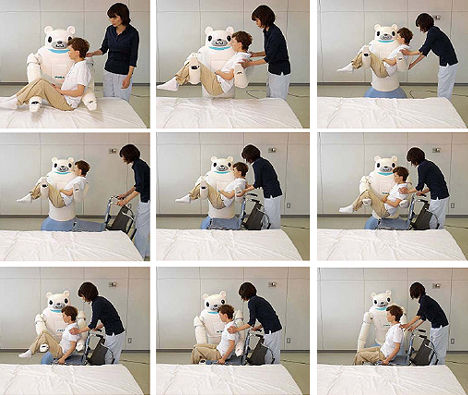 The robotic bear can also recognize faces and voices, as well as respond to spoken commands. Using visual and audio data from its surroundings, RIBA can identify co-workers, determine the position of those nearby, and respond flexibly to changes in the immediate environment. The motors operate silently, and a set of omni-directional wheels allow the robot to navigate tight spaces inside hospitals and nursing facilities. Japan, which faces an impending shortage of nurses as the population grows older, is looking at ways to offset the inevitable challenges that medical institutions will encounter in the coming years. Technology is regarded by some as the solution to this problem, and a considerable amount of government and private research is being devoted to developing robots capable of working in the healthcare field. 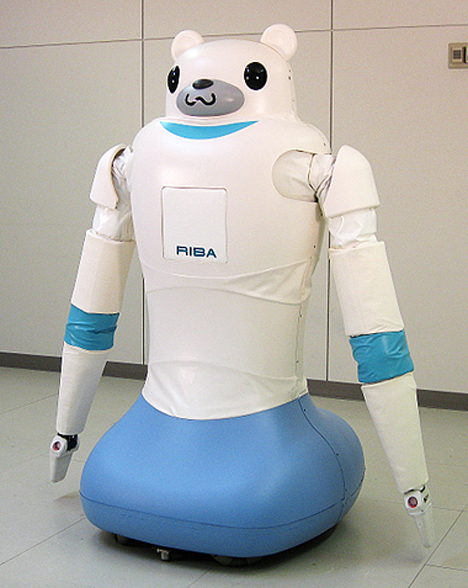 RIBA is an upgraded version of RIKEN's RI-MAN, a robot nurse assistant developed in 2006 that was only able to lift dolls weighing 18.5 kilograms (40 lbs). In addition to better strength and perception, RIBA's improved information processing technology allows it to crunch data at least 15 times faster than RI-MAN. This allows RIBA to move faster and with more confidence than its predecessor. RIBA's creators say they chose the friendly teddy bear appearance to put patients at ease. Attempting to make the robot look human would only frighten people, they claimed in their press release. RIKEN and TRI plan to put RIBA to work in hospitals within the next five years. Completely fascinating. Although seriously, I love how Japan "looks to technology" to deal with an aging population. Instead of, you know, just opening up immigration and importing all sorts of good skilled labor! But bear in mind that, unlike the USA, Japan's "system" of technological innovation is not fueled by military spending. Instead of the perpetual threat of a political enemy that is ultimately used as a pretext for investing in cutting edge R&D, Japan's "enemy" is the fact that its population is aging. The nurse shortage can and probably will be overcome by opening the borders as you say, but I don't think that's going to stop Japan from using it as an pretext to invest in new technology. Is it necessary to allow immigration? It only harms the economy and society of a country. Admission of alien people harms the natural cohesion of a well established environment. Robots can be fully integrated. I support this industry. It will solve many problems. Hopefully, robots will fill manual jobs and keep everyone in their own respective states. Nursing shortage in Japan is more complicated than shortage of absolute number of nurses. There are many nurses with active license who are not in the work force. Why? Hospitals only hire ridiculously small number of nurses for their work load. The lack of social support for nurses with family who wish to work as a full time nurse. Nurses' financial compensation is not great either, doesn't make much difference in the wage if she works in local grocery store with less stressful work load and better hours than nursing to accommodate raising kids. It's true that the Japanese society (both the government and the general population) are xenophobic when it comes to foreign work force, but I truly don't think it's such an attractive working environment for Philippine nurses etc that most of them will continue to move to the States or other countries even if the immigration is widely open. Am I the only one who thinks they need a different animal? yes actually its quite scary....o.o maybe a cat, or a hamster or a kawaii doggy but a bear o.o really? wtf. GREAT concept. I am a Nurse and this would come in handy, many, many times. The main problem is the weight limit it can carry!! pt's 135 lbs and lighter are NOT the problems we have. To be worth while and worth the money it would need to be able to pick up 300lb at least for the patients that I have encountered. 200 lb at the bare minimum. This robot is still under development. Considering it's over 3x stronger than it was 2 yrs ago, it's probably just a matter of time before it can lift the heaviest of patients. I would imagine though that a larger number of Japanese adults can still be helped with a 135 lb weight limit. Our country (the USA) is horrendously overweight and our need for 250-300 lb persons to be lifted should not be considered the norm. We should be looking to fix our obesity issues at the root of the problem, instead of continually adapting around it. don't you mean 200lb at the BEAR minimum?? The Hoyer lifts seem to be just as reasonable. The cost of this thing alone, besides the ridiculously low weight limit, would never be implemented in the US hospitals. We're chopping down on our nurses to cut costs for crying out loud. I would have to smack whoever would authorize the purchase of that thing. I... Love... You... sez the robot as it crushes your chest with piston rams applying 3000 pounds per square inch. Realistically, the US as a country is overweight. Japan will tell you this to our faces. Even so, it's still under development, right? Not a lot of things were perfect on the first try. -.- wonderful so you do know you are using a robot right now right? It's just a FORKLIFT under that cute exterior. HAHAHAHAHA So awesome i cant wait for it to come to Australia and lift me on the toilet! H E L L O ? R I G H T O N ! RIBA Hem?ire Ay? « Contain – Parlak Fikir,?novasyon,Trendler,Yeni bak?? a�?lar?! Robotic bear just wants to carry you | Yo Sekai! Weave$natch » Blog Archive » DUDE! RIBA the robot nurse bear - WTF? !